Our Fall Musical cast spends 10 weeks rehearsing dances, blocking and vocals for their fully choreographed, costumed, and lit production in the late fall. The wide age spectrum encourages intergenerational friendships among cast members, and teaches our older students to step into mentorship roles as they set an example for our younger performers. We select full-length Broadway scripts with material that challenges our students and provides a rewarding experience for committed grades school and teen performers who are open and willing to tackle advanced material, an intensive rehearsal process, and a few late nights. Recommended for: Students who have participated in a camp or other Haven production prior to auditions. Our Petite Players program was developed specifically for our eager group of young, budding performers, and offers developmentally appropriate curriculum with a bite-sized KIDS show for our tiny actors and actresses. Working with material created just for them, our Petite Players cast members rehearse for 10 weeks, and present a fully costumed, staged and choreographed production at the completion of their rehearsal process. Recommended for: First-time performers who want a chance to shine on stage! This program is also great for young students who aren’t quite ready to commit to the full length Fall Musical program. Developed to challenge and meet the needs of our Elementary Schoolers and Jr. Highers, our Spring Musical provides an opportunity for our younger students to take ownership of their craft using Jr. level shows that cater directly to the developmental level of the performers involved. We split our K-5th graders and 6th- 8th graders into their own casts, where students only have to compete for leads and solos with others within their own age span. 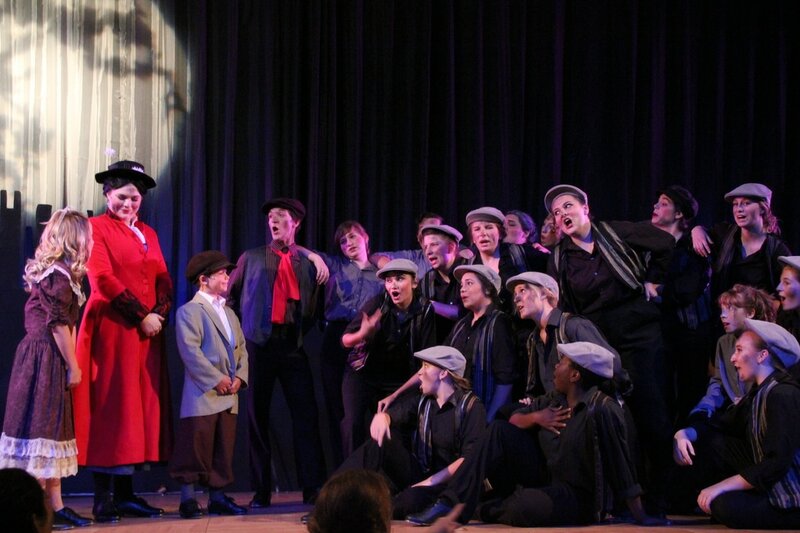 Young performers are able to rise to the occasion, practice agency, develop leadership skills, and hone their dance and vocal technique in a low student-teacher ratio environment. After a 10-week rehearsal process, students present their progress in fully choreographed, staged, lit, and costumed performances. Recommended for: Any student grades K-5 or 6-8 who is ready to be challenged in a fun and rewarding environment. Our Haven Cabaret cast is a group of elite teen performers who utilize the spring season prior to our Summer Musical as a time to hone their training through a black box production built specifically for the students involved. With opportunities for solo work and focused technique development, our Cabaret program fills the gaps of our teen student’s education. Exposure to otherwise unavailable theatrical material allows our teen performers the freedom to be challenged as dancers and vocalists and to explore artistically outside of the confines of a scripted production. Recommended for: Teens and upper level performers looking for solo opportunities and access to advanced material. Our highest level program that we offer at Haven, each Summer Musical is a small cast of 40-50 gifted teenagers who have demonstrated at auditions that they are capable of keeping up with Broadway choreography and a professionally paced rehearsal schedule. Upper-level students devote 10 intensive weeks to their craft, navigating mature content and demanding technique as they prepare for their performances. Recommended for: Experienced teens who are ready to work as a cohesive team to create art with their peers. Haven Choir is devoted to developing choral excellence through education, instilling values of self-discipline and commitment, while inspiring the artist within each child through the power of music. Our program includes training in musicianship, vocal technique, foreign language, instruments, choreography, and performance skills. Choristers work with a wide variety of high caliber choral repertoire from all musical periods and styles, and showcase their work in seasonal concerts. Designed for our very youngest thespians, our Pretend & Play class teaches the basics of theatre through play, music, and movement, exposing young performers to the art form in a fun and exploratory manner. This 8-week course concludes with a little taste of the stage by offering the opportunity for class members to perform a number with the Petite Players (Fall Season) or in our Spring K-5 Musical (Spring Season). Recommended for: Your little star who just can’t stop dancing in the living room and knows ALL the lyrics to Frozen :). Each year, we offer preparatory and conditioning studio dance classes to prepare our teens for their upcoming Summer Musical. Beginning in the fall, our 8-week courses focus on building the sustainable and safe technique and musculature required for our students as they head into their auditions for our higher level programs. Our dance courses evolve annually to meet the needs of our students, and are dependent upon the Summer Musical’s dance content. Recommended for: Students preparing to audition for Haven’s summer musical. Early in the season, we offer our Audition workshop to prepare our students for their upcoming summer auditions and focus on the skills, confidence, and etiquette that will impress directors at Haven and beyond. This crash course is open to anyone who wants to improve their auditions skills and find out how to really stand out among the crowd at an audition. Recommended for: Students preparing for an upcoming audition at Haven or elsewhere. Every summer, Haven offers a series of two-week summer theatre camps for our Elementary School age group. Campers meet daily Monday-Friday to rehearse dances, vocals and blocking for a full-length KIDS show performance. Rehearsals are structured rotationally, and give our campers a succinct but thorough theatre experience. At the end of their two week camp, students perform a fully choreographed, staged, costumed and lit show, giving them the complete theatrical experience in just 14 days. Focused on making the challenges of theatre fun and accessible, our Theatre Camps are great for first time students who want to get their feet wet. Recommended for: First time performers, new Haven students, and students who aren’t quite ready to commit to the more intensive10-week rehearsal process. Teen level Theatre Camps follow the same two week schedule as our K-5 summer theater camps, but are on the more rigorous side, as they are catered to our students who aren’t quite ready for our Summer Musical but still want to be challenged and hone their skills. Campers spend two weeks in intensive dance and vocal rehearsals, completing their camp experience with a fully choreographed, staged, costumed, and lit performance. This particular camp program has been designed to address our Haven students who feel as if they “fall through the cracks”- students who need that extra boost of instruction in order to achieve their goals. For this reason, we cap our Intensive Camp program at 30 students only. This small group environment allows for one on one instruction and guaranteed solo performing experiences. A select group of campers spends their two weeks of camp learning and rehearsing a variety of numbers, which they present as a Musical Review in a black box theatre performance. With a focus on technique and solo performance opportunities, campers gain tools for continued growth and future success in our program. Recommended for: Students who feel like they need an extra edge in their training, or who haven’t had extensive solo experience and dance instruction.